Herbal Remedies: Is Going Natural Safe During Pregnancy? Though medicine can be used to treat many discomforts of pregnancy such as nausea, vomiting, and anxiety, many women prefer a more natural approach with herbs to help alleviate these symptoms. Before trying an herbal remedy, though, a pregnant woman should take extra precautions, as there have been few studies done to test the safety of various herbal supplements for the woman and developing fetus during pregnancy. It is known that certain herbs (depending on dosage) can cause harm to the fetus, resulting in miscarriage, premature birth, uterine contractions, or injury to the fetus. More reason to be cautious is that the FDA does not evaluate herbal supplements in the same way as prescription medications, so reliable safety information is hard to find. For these reasons, the FDA recommends that a woman consult with an herbalist or health care provider before taking any herbal supplements during pregnancy. The amount of the herb you consume matters in many cases. 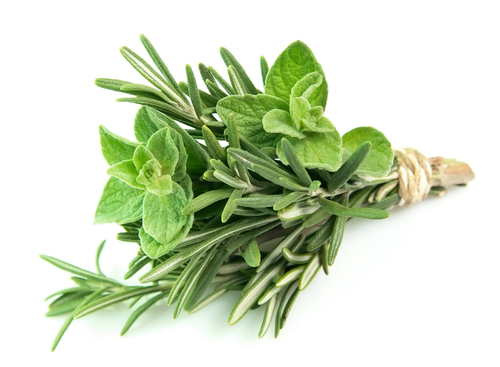 A sprinkle of rosemary will not cause you or your baby harm, but if it is used in a large amount- like that used in medicinal doses- it can become harmful. This is true for garlic, sage, ginger, and turmeric. Using these herbs in food poses no risk to mother or baby, but when large, more concentrated doses are ingested, this is no longer the case. There are some herbs that are considered unsafe during pregnancy and should be avoided. Saw palmetto, Goldenseal, Dong Quai, Ephedra, Yohimbe, Pay D’ Arco, Passion Flower, Black Cohosh, Blue Cohosh, Roman Chamomile, and Pennyroyal. There are some herbs that have been shown to ease some symptoms of pregnancy. The following are safe to consume and their associated beneficial effects are listed as well. Red Raspberry Leaf: Shown to reduce risk of complications during pregnancy and use of interventions during birth, this herb is found in teas and is rich in iron. It is also known for helping tone the uterus, increasing milk production, decreasing nausea, and easing labor pains. Health professionals recommend only using it after the first trimester. Oats and Oat Straw: Rich in calcium and magnesium, the tea form can be consumed to relieve anxiety, restlessness, and irritated skin. Other herbs such as chamomile (German), dandelion, and nettles, all have insufficient evidence to conclude whether they’re safe or not. Dandelion is shown to nourish the liver, chamomile can help with sleeplessness and joint inflammation, and nettle is found in many teas as it’s said to be a great overall pregnancy tonic. Further discussion with your health care provider is needed to decide if these herbs are safe for you. To find the safety ratings of various herbal supplements go to Natural MedicinesDatabase at www.naturaldatabase.com. Alternative ways to help alleviate common discomforts of pregnancy have been explored by woman throughout the centuries, so don’t hesitate to learn more- it’s only natural!